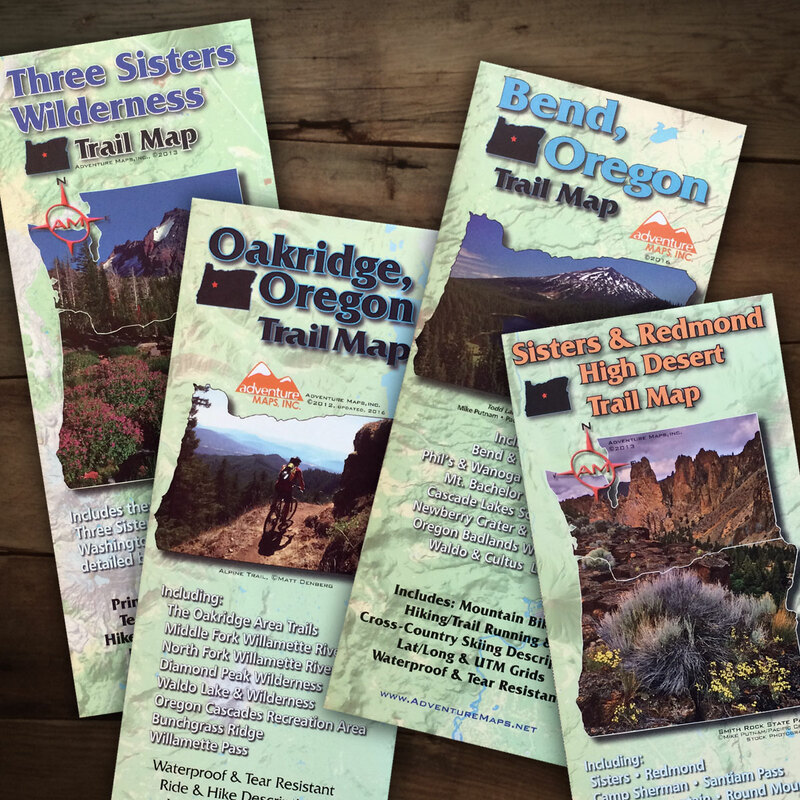 We’ve gotten a few emails from folks asking us how to update trail reports on the website. After emailing some instructions, it seemed like a better idea to write a quick post about it. If you have suggestions about the site, or run into trouble, drop us an email. The images below are from the desktop version, but phones work pretty much the same. 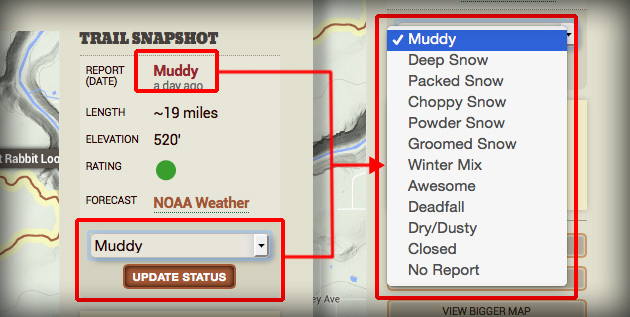 Use the pull down menu to update the trail status. Once saved it will update site-wide. Click Join in the main menu. Already have an account? Skip to Step 4 below. The site will generate a one-time link which will allow you to pick a password. If you lose your password, the process is basically the same, just click the ‘Lost your password?’ link. Not ‘1234’ or ‘StarWars’. Make it hard to guess. Different from your bank account. You can add an optional avatar to your profile by setting up an account at Gravatar.com. Gravatar is a universal avatar format which works on nearly all websites. You’ll find a Log In link in the main menu. Boom. You’re in! From the main trail list or the Bend trail map. Whatever you prefer. On desktop computers and tablets, you’ll find it in the upper right Trail Snapshot. On phones, the menu is probably near the bottom of the first screen. We log the timestamp and your username but don’t display them to the public. 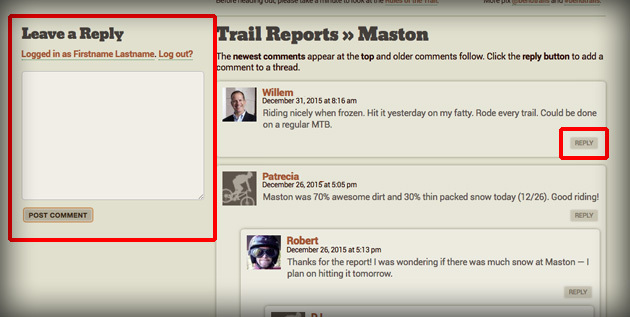 Once you’ve registered and logged in you can start or add to a threaded discussion about a trail (or a blog post). Newest comments always appear at the top. Scroll down. Discussions are on the bottom of the page. Just type in the text field and hit Post Comment. Kerpow. If you want to have a threaded discussion or reply to a specific point, just hit Reply and your comment will be attached like the illustration above. Visit the Gravatar website and follow their instructions to set-up a universal WordPress avatar. Just thinking… it may be worthwhile to post trail conditions that go back a week instead of having posts that go back over a month or more or even last year…. The more updated information will streamline what we need to know and reduce the clutter and keep things relevant. Thanks for the idea. Some trail conditions stay the same for 6 months or more and users tend not to report unless the conditions have changed. Maybe six months might be a good time to set the status to ‘Report Needed’? Sounds good, 6 months should be a good feedback time loop especially if trail clearing needs to be noted. Anything later than that would seem to be more or less irrelevant. Swamp Wells up from China Hat rd down Coyote Loop. Nice conditions due to the recent rain. No trees down. Any plans to add Crooked River Ranch? Yep. I saw Mark’s article the other day. We’ll add these trails to the site when track down some GPX data. It looks like an interesting place to ride. I scouted Bens, Kents, and Phils from the Phil’s TH yesterday. Not ready yet (much too soft) & turned back on each, but encountered other riders who I believe continued on. With the rain today I cannot see how they will be ready anytime soon, though I cannot speak for fat-bikes,,,,that might be OK. Would love to see people stop loving these trails to death. Thank you for all the riders that took advantage of the great temperatures last week and really messed up the trails… majorly. If you were locals, shame on you!!! You should know better… But apparently that doesn’t seem to be the case. If trails rut out after a some minutes of riding turn around or ride the logging roads. But thanks to your desire to continue riding, with the conditions that prevailed, the trails went to hell in a hand basket to put it mildly. Great idea to ride around soft spots till the trail is worthy of a 4 wheeler trail…. Enough said, you know who you are… Be smart with our trails, do you want single track or do you want a road… The trails are sensitive and will be difficult to repair. Thank you COTA in advance for what you will need to do this coming season… This is more than disappointing…. This is great and thank you. Perhaps, send an email blast to encourage usage/adoption?